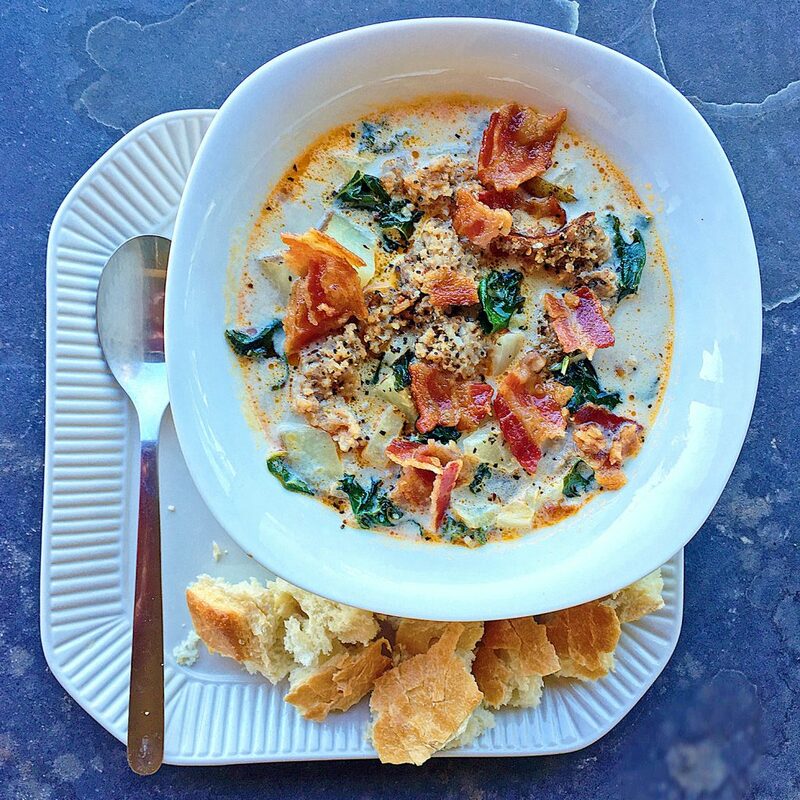 Presenting ‘Slow Cooker Zuppa Toscana’ – a copycat version of Olive Garden’s ‘Zuppa Toscana Soup’! This warming comfort soup is filled with Sausage, Kale, Bacon, & Potato. We love this dish because #1) It tastes amazing #duh 2) The Crockpot does all of the work! WIN WIN, people! In case you are not familiar with Olive Garden’s version (in which case we are so sorry), this dish is a creamy, rich soup with Italian Sausage, Kale, and Potatoes! But we added Bacon to our version because … well, bacon. Enjoy this Slow Cooker Zuppa Toscana accompanied by nice, crusty bread for dipping. There is nothing better than this creamy, hearty, filling soup on a cold fall or winter day. 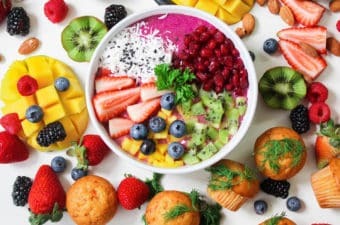 It’s equally as exciting to set the slow cooker in the morning, just KNOWING that you are coming home to all of this deliciousness, no matter how good or bad your day may end up. To make this recipe even easier than it is, we like to do all of the minor legwork the night before. This saves you hassle and time in the morning; effectively freeing up much more time to daydream about your slow cooker zuppa toscana versus having to prep it still (which would obviously leave a lot less time for daydreaming, gross). Just a little psychology trick to keep you excited about this situation ALL.DAY.LONG. You can chop and prep the sausage, potato, onion, kale, and bacon (if using) the night before. Cook and drain sausage; using a large bowl combine it together with diced potato/onion/kale. 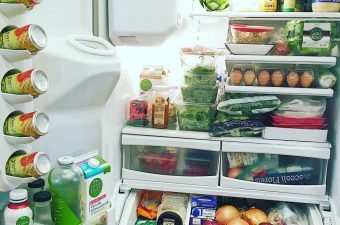 Store in airtight container in refrigerator overnight. Keep bacon strips stored separately until ready to serve (you will be adding them to the top of your zuppa toscana soup just before serving- so don’t add them to the crockpot). And viola! Meal prep done, and is now ready to be thrown into the slow cooker in the morning! All you have to do is remember to add the chicken broth, heavy cream, garlic, and spices! Definitely use “Hot” Italian Sausage for this one, not “Mild” or “Sweet.” Well, actually, you can do whatever you want because you’re a grown adult, but just saying… The “Hot” sausage gives it a little somethin’ somethin’! You can sub half and half for the heavy whipping cream – the end result just won’t be as rich. 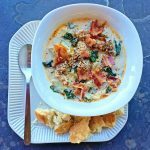 Super satisfying copycat version of Olive Garden’s ‘Zuppa Toscana Soup’, made in the slow cooker! In a skillet over Medium-High heat, brown your Sausage, 6-7 minutes. Drain on paper towels, then chop into pieces. Combine Sausage, Onion, Russet Potatoes, Chicken Broth, Garlic, Dried Basil, and Red Pepper Flakes (if using) in Slow Cooker. Make sure there is just enough liquid to cover everything. If not, add a bit more chicken broth (or water). Leave covered in Slow Cooker for 4-5 hours on High, or 6-7 hours on Low. Remove lid on Slow Cooker. Add Kale and Heavy Whipping Cream, plus Salt and Pepper to taste. Stir to combine. Replace the lid, and let cook another 20-30 minutes until soup thickens. Just before serving, place some of the cooked Bacon and Parmesan Cheese on top of each bowl. Serve with crusty bread pieces on the side. Enjoy! Holy SMOKES this was amazing!! There were no leftovers to speak of between my boyfriend, myself, and my parents because it all disappeared in 1 sitting. We added double the bacon to ours, but kept everything else the same. Delish!